I consider myself a newbie iPad owner though we’ve had one ever since the first one came out; I am still learning all of the various ways that I can substitute my iPad in when it’s not practical to use my MacBook Air. I’ve slowly become more used to typing on my iPad, which means that I may eventually be fully comfortable with leaving my laptop at home on short family trips and solely relying on my iPad. However, in order for me to do that, I needed to find a case that I felt would give my iPad all around padding and protection; the case I had been using up until now is an Apple product that magnetically connects to my iPad, but only covers the screen. StoryLeather offers many alternatives and rivals to similar style cases that you might find at the Apple Store and other retailers. 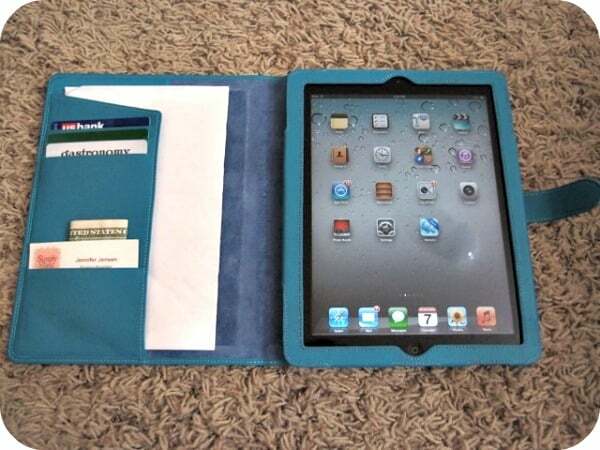 I was immediately attracted to their Napa Genuine Leather Folio Case; it comes in a bright turquoise that appealed to my color preferences, and also provides protection to either side of my iPad 2, as well as its edges. This particular folio case from Storyleather is handmade to order; consumers have the option of purchasing one that is readily available on the site, or having one entirely custom made. The one I chose was currently available on the site. The exterior leather is smooth to the touch; the interior is a complementing shade of blue, and there are slots to hold business cards, credit cards or cash, as well as important papers that might be distributed during a business meeting. The iPad2 folio case securely fastens with a magnetic strap, so I am never worried about it easily coming undone as I am walking around with it loose in a large shoulder bag. My husband unfortunately discovered one downside to this particular folio case; if you are the type of person that likes to fold the front flap of your case behind your iPad, your iPad will instantly turn itself off and you will have to press the Home button to get it to turn on again. Other folio cases that he has tried with his iPad have not caused it to turn itself off. The Napa Genuine Leather Folio Case is appealingly priced at $49.99 (this may be a limited time offer) with expected delivery within 1-2 business days. Customer orders, on the other hand, may take anywhere between 25-30 days to be created and finally delivered. In addition to the Napa Genuine Leather Folio Case, I also received a second case (called the Smart Case). This case is more lightweight than the folio case, and is one of the options that you have if you decide to have Storyleather design a custom case for you. This particular case features inspirational words related to the Christian faith in the shape of a cross. Storyleather offers international shipping, a PayPal option for payment, and a variety of styles and colors for your particular electronic device; check out their site now and see what they have available for your smart phone and even your eReader! I like the Apple iPhone 3G & HTC Touch HD Classic Wide with Color Lining + Leather Strap. I like the Hampton case. Love the leather iphone cases! I like the 8 card Long Wallet. Oops… I got “enter” happy and didn’t see for sure what I was supposed to comment on. But, I think we were supposed to pick a style or color. 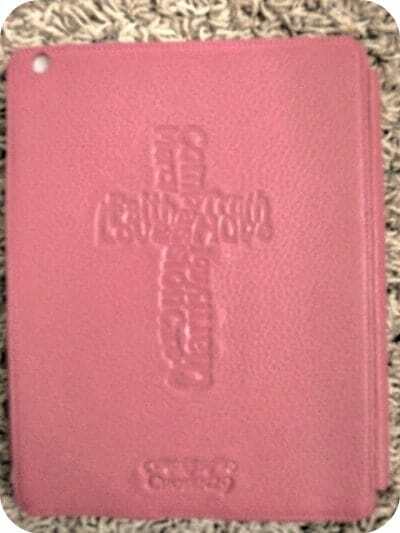 I really like the Pink Apple iPad2 Genuine Leather 4-Fold Full Cover Case. I like the Folio Book Cover. I like thev 15-Cards Tri-Fold Medium Wallet with Zipper Coin pocket. I like the Hampton eReader case. I like the Quilt Pattern Lady’s Leather Shoulder Bag. a fully customizable wallet would be awesome! I like that the HTC 4 fold fler has a stylus holder, too. I love the Hampton Tablet case! I like the woven leather travellers bag. I like the Quilt Tablet. I like the wallet phone cases. Black Apple iPhone 5 Premium Leather Holster. Thanks. I like the Zippered book case. I like the Black Apple iPhone 4 / 4S Hard Shell Down-Fold Flip Quilt Pattern Leather Case! I like the quilted tablet case.